Some babies are almost as active in their sleep as when awake. Jadens World was born like many companies. We were made aware of parent’s struggles in trying to keep their babies warm during daytime naps and nighttime sleep and were told that sometimes the wearable bag type sleepers are not enough especially since most families are trying to conserve on energy by turning thermostats down. 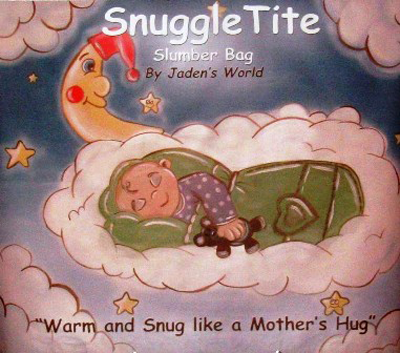 We developed the SnuggleTite Slumber Bag to meet these needs. With the unique design, the SnuggleTite Slumber Bag has the versatility of a sleeping bag with the warmth of a quilt and with the added feature of tightening around the baby to keep the blanket form being kicked off while meeting SIDS guidelines for a safe alternative for loose bedding. It gives parents the peace of mind that their baby will be safe, comfortable, warm and snug, because when baby sleeps soundly, then so will the rest of the family.